Leonardo da Vinci, 1452-1519, one of many Italian famous artists in art history, studied light and the effects it had on the human figure. He did not like harsh direct light on faces, but favored light that illuminated a face just before the sun rose in the morning, and how light fell across a face just after the sun went down. To achieve this art effect in the studio he recommend painting the four courtyard walls black. Then stretch a sheet of linen over the top of the walls and place the model underneath in order to get the defused light that illuminates the face not producing sharp shadows that break up forms. Examples of this can be seen in one of Leonardo da Vinci's famous paintings "Mona Lisa", 1503, and in another work of art "Madonna and Saint Anne", 1508-13. In the "Mona Lisa" Leonardo painted an idealized portrait, a monumental, grandeur appearance, which would characterize much of High Renaissance art. The "Mona Lisa" took three years to paint and was in the end kept by Leonardo himself. Leonardo da Vinci created a new format for portraiture in art when he painted the "Mona Lisa". He rendered the sitter full figure below the waist so the viewer can see her arms resting relaxed on the chair. The new style paints the full essence of the figure as she sits, a full personality instead of a bust. Light to Leonardo penetrates pre-existing darkness but can't fully replace it. Creating the atmospheric perspective of sfumato he softens the edges of his forms blending them into the surrounding dark area or nearest color field as shown in the "Mona Lisa". Leonardo da Vinci painted the "Madonna and Saint Anne", 1508-13 using Pollaiuolo's foreground pyramidal art structure, a structure also used by other artists of the High Renaissance. The pyramidal structure is a format, which would be used later as a format in High Renaissance artists. In this painting Leonardo used fewer figures in his pyramid. The composition is compact; the figures are simple, very monumental, and very grand. Leonardo's ordered compositions can be seen in his Albertian one point perspective painting "Adoration of the Magi", 1481, never completed. His linear orthogonal lines converging on a point can be seen in his architectural pen and ink drawing for this painting in the Uffizi, Gallery, Florence. By the time Leonardo da Vinci painted one of his most famous paintings, the "Last Supper", 1495-98, he had dropped the strict one point art perspective in favor of ideal perspective, an idea becoming pervasive in the the High Renaissance of art history.The disciple figures surrounding the rear of the table are ideally grouped and packed together. Looking closely at the figures one realizes they can't all fit realistically together on the same side of the table as they do. Leonardo does however fit them all together artistically and ideally. 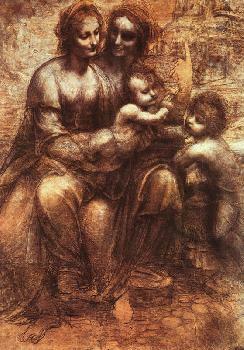 Leonardo also painted the instantaneity of the moment in this painting. The scene is at the instant Jesus Christ said, "one among you will betray me". All of the Apostles are reacting to Christ's words, and Leonardo records their instant actions and expressions. Leonardo da Vinci expanded on the instantaneity of the moment in his painting "Battle of Anghiari", 1503-06, now destroyed, but saved in a copy sketched by one of Baroque’s famous artists, Peter Paul Rubens. In this painting, Leonardo created a sublime monumental composition of active battling figures in the frenzy of immediate war. The soldiers roll and tumble with the horses in the turbulent action of the moment. The "Virgin of the Rocks" painted in 1485, shows St. John adoring the Christ Child in the presence of the Mary and an angel. The subject matter of this painting, the childhood of Jesus Christ, is the first of its kind. According to a legend known in Leonardo da vinci's time Saint John, the half brother of Christ, spent his childhood in the wilderness, and is shown here wearing a hair shirt. There isn't much more known about the setting of the painting. Why the scene is rocky, with a pool of water and fresh plant life in the foreground isn’t known. Other famous artists of the Renaissance period in art history are Titian and Raphael. To view the entire gallery 1 of Leonardo da Vinci posters click here. To view gallery 2 of giclee’ paintings, click here. Subscribe with your Reader, to my RSS Gothic Art feed: http://www.